This large disk are collecting electrode at high temperature density ion collector. 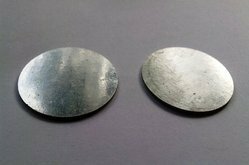 These disks are manufactured by melting iridium metal rolled into sheet and cut into required shape. We are a renowned name, which is engaged in offering Iridium. Tennant discovered iridium in 1804 in the residue obtained on attacking impure platinum with aqua regia. Its name is derived from the Greek ιρις (rainbow) and reflects the various colours of its salts. It’s the most extreme member of the platinum group. This whitish metal has a super high melting point, is one of the densest elements around and stands as the most corrosion-resistant metal. 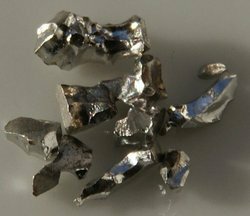 Iridium is processed from platinum ore and as a by-product of nickel mining. Iridium is the second densest element and is the most corrosion-resistant metal, even at temperatures as high as 2000 °C. It does not react with any acid and can only be attacked by certain molten salts, such as molten sodium chloride. In order to meet excellent quality standards, we are supplying Iridium Metal. We are engaged in offering Iridium Metal . ridium offers customers precious metal electrode designs for extended spark plug life. Eurotech Global Solution India Pvt. Ltd.
We are engaged in offering Iridium Precious Metals.